Yesterday was the day that the Light Sport segment of general aviation finally got vindication and validation. No longer will anyone view the smaller LSA flying machines as step-children of all other aircraft. That's because Cessna has decided to move forward with building their own LSA. This can only be seen as very good news for GA as a community. No other maker has the name brand recognition as Cessna, and it's pretty common to hear non-pilots refer to any small GA plane as a “Cessna”...even ones with low wings. This decision to greenlight the LSA shouldn't come as a surprise to anyone who has seen the Cessna proof-of-concept mockup at the 2006 Airventure or at Sun nFun this year. From the minute the gates opened during those shows, crowds flocked to the Cessna LSA display, and never stopped gawking until the afternoon airshows began, which drew everyone to the flight line. 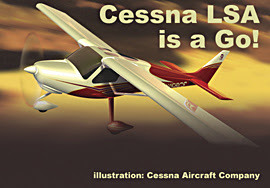 Watching this kind of interest develop first-hand back in Cheese Country was proof to me that there is indeed a market out there for a Cessna-made LSA product. Question: Customer demand is clearly there for your LSA proof of concept, yet the first quarter 2007 deadline you set to either enter the light sport market or not has passed without a decision. Why? I believe that the Cessna LSA will open the doors to a large number of future pilots who love the lower cost of a Sport Pilot ticket, but have stayed away because they just didn't feel comfortable training in a Jabiru or Icarus. Those aircraft – and most all other LSAs – are solid VFR platforms, but have zero name recognition and no safety history. By flight lining Cessna's LSA, flight schools will be able to offer that same lower cost flight instruction in a bird that those new students will easily recognize. The concept aircraft Cessna unveiled last year has a high wing spanning 30 feet, side-by-side seating for two, a tricycle gear and a 100-horsepower engine. It also has dual control sticks, upward opening doors, toe brakes and a castering nose wheel. While the aircraft will not be a large source of revenue for Cessna, "We're going to sell a lot of them," said Cessna spokesman Doug Oliver. Cessna said that it estimates a market for 600 of the light sport planes a year as long as the price is kept at about $100,000 or less. Good work, Cessna. I'm glad you have decided to pull your single-engine line out of park and finally begin a much-needed move forward with this LSA and the NGP. We all know that while the 172, 182 and 206 lines are solid, reliable machines, many consider them to be overpriced, and are starting to look a little dated compared to the SR22 G3, the Columbia 400 and high end Mooneys. Bet the farm that Cessna will move forward soon towards a Thielert-powered, all-composite, all-G1000 line of piston singles. And I'm not some sort of guru figuring that one out, it is the only logical choice Cessna can make to freshen their product line. And the decision to build the LSA is the first step in that effort.